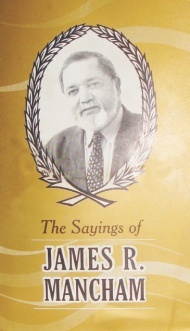 The Sayings of James R. Mancham. Printec Press Holdings (Py) Ltd., Seychelles, 2002. N.B. : Out of print. New edition to be published in 2010. Meaningful truths are never newly discovered. They are just uncovered anew by those who allow themselves time to think. Unfortunately, very often clear thinking and ideas worth expressing get buried in verbiage. Since I joined the Seychelles Review in 1994, I have had a very close association with the work of James R. Mancham and became fascinated by his writing style and special love of words. I am told that he derived it from his father, Richard Mancham, who loved oratory and wanted to be a lawyer but ended up a successful businessman during the colonial era. Considering James R. Mancham as a great visionary, I have thought that it would be sad if his words of wits and wisdom were to be allowed to be lost in the mists of past history. My research of some of his speeches and published articles has revealed several memorable epigrams, phrases and witticism which are no doubt the product of a fertile and versatile mind. On Friday 5th July, 2002 the International Conference Centre in Victoria was full to capacity for a ceremony hosted by the Rajiv Gandhi Foundation (Indian Ocean Chapter) in honour of three outstanding Seychellois who had been nominated for the Foundation’s Life Time Achievement Award for their contribution to the social and economical development of the Seychellois society. James R. Mancham was one of the three who received the Award. I have thought it appropriate to reproduce in the beginning of this book what the Chief Justice of the Republic of Seychelles the Honourable V. Alleear said about Mr Mancham on this occasion as well as Mr Mancham’s response. “…After very careful deliberation, the Foundation has this year nominated three outstanding personalities for this ever prestigious Life Time Award. Each of them in his own field of activity and association has contributed to the social and economical upliftment of the Seychellois society. The first nominee is Sir James Richard Mancham, the Founding President of the Republic of Seychelles and current Leader of the Democratic Party. Mr Mancham, a Barrister from Middle temple, a globe trotter par excellence, has become a celebrity the world over. He is a prolific writer, a natural charmer with a flamboyant personality. His keynote address on world peace in South Korea in February 2000 and at the Summit Council for World Peace in New York in May 2001 have been acclaimed the world over. Sir James, fondly called “Papa Labarbe” by many Seychellois immediately brings to mind the notion of peace in the social, economic, political and other fibres of society. James Mancham has made peace and reconciliation his life mission. For him peace is the building block upon which a healthy society stands. He has been instrumental and relentless in his pursuit of a non-violent policy for his beloved Seychelles. It is a measure of Sir Mancham’s sagacity that he has not succumbed to cheap politicking but has embraced a policy of peace and national reconciliation. He has put his country before self. He has never denigrated his country for political mileage. He has taken control of the steering wheel to set the process of national reconciliation in motion. He is presently still steering the nation into a virtuous direction. He treads very cautiously. He knows when to break in time when danger looms. Many a time he has pulled back to avoid confrontation. Slowly but surely, like “Père Kobe” who is still going strong. Sir Mancham’s ideology is gaining mileage and making strides in the right direction. intérieure qui coule au dedans de nous. gré des courants de la vie. En parfait harmonie avec l’univers autour de lui. Un tel home aura un Coeur qui se porte bien. Sir James, like you, we share in the notion of peace and national reconciliation which we believe is the only way to our salvation. “I am certainly not too sure whether I qualify to receive the high honour and recognition bestowed on me by the Indian Ocean Chapter of the Rajiv Gandhi Foundation. Whilst it is true that I have been involved in diverse initiatives over the last few years in the pursuit of National Reconciliation in Seychelles and in the pursuit of peace worldwide, I never expected that this would have brought to me such a singular recognition. Whilst I admit that as a response to my human ego, I have over the years had a penchant for collecting testimonies and certificates attesting to this or to that achievement, from different parts of the world, it must nonetheless be noted that I culminated my work Peace of Mind with the following lines. Perhaps, what is important about this evening’s celebration is the initiative taken by a local organization to provide me with the awareness that my work for peace and reconciliation has not gone un-noticed and that I should continue with it. For Soeur Chantal, it is an acclamation for selfless dedication over many, many years to community service and for Mr Clet Rivière, a recognition of the shining example he has set as an individual who has risen u to meet the challenges of daily work in an exemplary manner. What is indeed important about this event is not that it seeks to honour the three of us in the way it has done, but that it projects vis-à-vis the wider public, the message that whilst certain endeavours may not bring monetary reward, they are certainly appreciated and cherished by fellow men of goodwill. That a society is able to do this, is part of the process of nation building and an indication of its growing maturity.